Directions: The Federal Rear Guard at Dry Fork Creek tour stop [Waypoint = N37 16.034 W94 19.499] is located near Carthage, Missouri 64836. 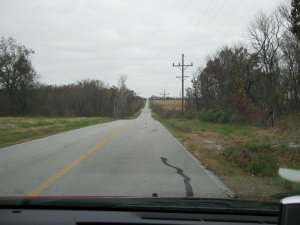 Drive south on Civil War Avenue for about one half of a mile. After crossing the bridge over Dry Fork Creek you should be able to pull to the side of the road just opposite the second Granite Marker near the top of the hill. 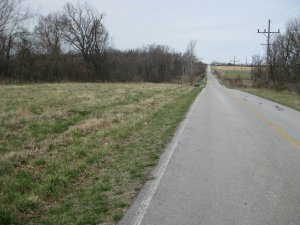 The marker is on the east side of the road. The rear guard was made up of five companies along with Essig's four gun battery. The rear guard no held the high ground just south of Dry Fork Creek. Essig's artillery covered the ford over Dry Fork Creek right where the bridge is today. Except for his exposed flanks, Sigel held a strong position. When the Missouri State Guard advanced on Dry Fork Creek, Essig's Battery was able to prevent them from making much headway. Eventually, they were able to reach the creek and the fighting continues at close quarter with the Missouri State Guard on the north and the Federals on the south side of the creek. Around 1330h, the Federal Rear Guard suddenly withdrew from Dry Fork Creek. Meanwhile, Hassendeubel reached the wagon train and took control of their withdrawal south. The moral effect of the enemy's mounted regiments behind our lines . . . could not be denied. To lose our whole baggage was another consideration of importance. 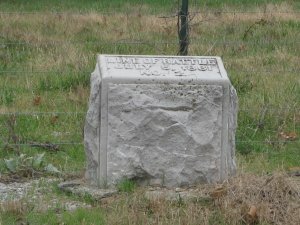 It was therefore with great mortification that I ordered one part of the troops behind Dry Fork Creek, whilst Lieutenant-Colonel Hassendeubel, with the First Battalion of the Third and a battalion of the Fifth Regiment, under Lieutenant-Colonel Wolff, followed by four pieces of Captain Wilkins' battery, repaired to the baggage train to defend it against the projected attack. TThe enemy followed slowly toward Dry Fork Creek. Captain Essig's battery had taken position behind the ford, assisted by one company of the Fifth Regiment on the left, and two companies of the Third Regiment on the right, whilst two companies of the Fifth Regiment remained as a reserve behind both wings. It was at this point that these troops resisted the enemy's entire force for two hours and inflicted on him the severest losses. 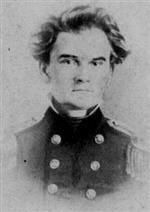 Lieutenant-Colonel O'Kane, with his battalion, upon the receipt of my order, advanced rapidly through a field, and on the skirt of the timber nearest to us fell in with the enemy, and aided by Captains Gaines' and Kelly's companies (General Clark's division) and Colonel Burbridge's regiment (General Clark's division), engaged the enemy, and after a short conflict drove him through the timber across the creek back upon his main body. Lieutenant-Colonel O'Kane had his horse shot under him, and suffered a loss of 2 killed and 20 wounded. Lieutenant-Colonel O'Kane makes honorable mention of Captains Hale and Vaughn, who rushed into the conflict, and also of Captains McElrath and Gray, and Lieutenant Taylor, commanding Captain Warren's company--Captain Warren having been shot through the leg by a grape shot. Responding with spirit and zeal to my order, Colonels Graves and Hurst threw their regiments into the timber on the right of the artillery, and advancing to the creek found it impassable on the direct line of attack at which they reached it, and, being forced to seek a ford at a point below, passed through the timber on the farther bank of the creek on the enemy's left flank, but not until he was in the act of retiring. The enemy was a third time forced to retire. Seeing that there was a prospect of surrounding the enemy, I ordered the whole of my cavalry, Colonel Brown commanding, to Bear [Dry Fork] Creek, to occupy the timber at the crossing, and, if possible, prevent their retreat. The enemy, discovering the object of this movement, commenced a slow and sullen retreat by their right flank . . . The cavalry did not succeed in getting the position designated for them, in consequence of which the enemy were successful in recrossing Bear Creek and establishing themselves on a steep eminence on its south bank. Reconnoitering this position . . . I found the enemy's batteries stationed so as to completely command the crossing, which was about 30 feet wide, the creek itself being about the same distance in width, thick timber and undergrowth lining the banks of the stream on either side for about 30 yards in width to the right and left of the crossing for several miles above and below. On their right flank on the north side of the creek and to our left of the ford was a large field, its southern boundary being on the timber north of the creek. The enemy's batteries from the eminence on which they were posted completely commanded the field. Discovering their forces deploying to their right, and taking possession of the timber on their side of the creek, I found it absolutely necessary for the success of the day to make a rapid movement of the infantry through the field above mentioned and get possession of the timber on our side of the stream. This movement was executed with great gallantry . . . The enemy used every effort in their power to prevent the success of this movement. They fired rapid volleys of grape, shell, and round shot upon this command in its advance through the field; yet our troops, without wavering, gallantly succeeded in gaining the south side of it, unit, rapidly deploying, threw themselves over the fence and into the timber. In the mean time Colonel Weightman had planted his battery on our side of the creek in the road immediately in front of the enemy's and opened fire. The action on the enemy's right with General Clark’s infantry and mine-now became general, the opposing lines having armed within 30 or 40 yards of each other. Brisk volleys on both sides were kept up for nearly half an hour, and the enemy finally gave way and retreated under cover of their artillery.